Barbara M. Hallman, Art and Music: Nice to Meet You, Leiser Farms! Nice to Meet You, Leiser Farms! As a full-fledged, card carrying member of the adult world, I take notice when I feel like an eight-year-old again. Somehow going to a gourd farm reverts me back to a child on her birthday! 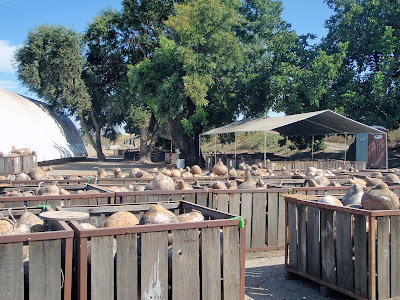 I had the pleasure of visiting Greg Leiser Farms in Knight's Landing, California, just outside of Sacramento. Greg and Mary Leiser were very accommodating: Mary showed me around the gourd bins and she and Greg talked about their third-generation family farm. There were some good bargains to be had and some different varieties I hadn't seen before so I chose a bag full and had to be on my way---I could have stayed longer, but I could feel my travel weary family's telepathic messages to hurry it up!